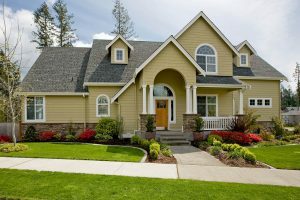 When hiring a professional to do the exterior painting on your home, there are several steps that need to take place to ensure the best paint job can happen. Whether suggested by the professional or not, you should make sure that they take these three preliminary steps to ensure a long-lasting and durable paint job occurs. If there is no visible damage to the paint that will be getting covered with a fresh coat, it would seem that painters can just show up with a new pail of paint and get started right away. However, this can cause several problems with your exterior painting. Dust and dirt can get trapped in the paint, causing the new paint to look bumpy or to not stick. This can affect the appearance but also cause chips or peeling in your new paint. Before professional painting begins, the surface of the exterior should be pressure washed to give professionals a clean surface to start with ensuring the optimal paint job takes place. It is tempting to just throw a layer of paint over an old surface with chips and peels, but that should never be done and will never be recommended by a professional. Stripping damaged paint and fixing repairs will ensure that the fresh coat of paint sits properly on your exterior and that it is durable and long-lasting. Depending on each situation, ask your professional if your home needs to be primed before the exterior painting can take place. In the case of damaged areas or exposed surfaces, priming the area to be painted will seal the exterior surface so the paint does not soak into the wall. It will also allow the paint to stick and hold its fresh, bright color for much longer. These steps and others taken by professionals will ensure that your exterior painting project keeps your home protected, and you happy for years to come.